The ex-White House strategist, who left Breitbart to join the Donald Trump campaign in the summer of 2016, will work with Breitbart on a smooth transition, chief executive Larry Solov said. 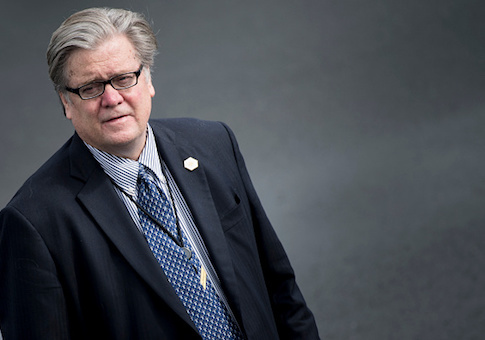 Bannon's departure from the right-wing news organization was forced by billionaire Rebekah Mercer, according to the report, part of a falling out over Bannon's participation in Michael Wolff's explosive new book about the Trump administration. Bannon was fired from the White House in August, at which time he returned to Breitbart News. He has since actively recruited and backed candidates as part of what he calls a war on the Republican establishment. In Wolff's book Fire and Fury: Inside the Trump White House, among other scathing remarks about Trump and his orbit, Bannon described the 2016 Trump Tower meeting between Donald Trump Jr. and a group of Russians as "treasonous" and "unpatriotic." He went on to say that special counsel Robert Mueller's investigation into alleged collusion with the Kremlin will focus on money laundering, and he believes the investigation will "crack Don Junior like an egg on national TV." President Trump released a statement last week ripping into Bannon and saying he had "lost his mind." "Steve Bannon has nothing to do with me or my Presidency," Trump said in the statement. "When he was fired, he not only lost his job, he lost his mind. Steve was a staffer who worked for me after I had already won the nomination by defeating seventeen candidates, often described as the most talented field ever assembled in the Republican Party." "Steve doesn't represent my base-he's only in it for himself," Trump added. "Steve pretends to be at war with the media, which he calls the opposition party, yet he spends his time at the White House leaking false information to the media to make himself seem far more important than he was. It is the only thing he does well." Bannon subsequently walked back his remarks and released a statement praising Trump and his son, but the damage was done. This entry was posted in Politics and tagged Donald Trump, Donald Trump Jr., steve bannon. Bookmark the permalink.